Syria on the road to chaos? Last night I attended a lecture titled “Syria on the Road to Democracy or Chaos?” by Ph.D. Candidate Mohammad Maghout hosted by the Institute of Oriental Studies in Leipzig University. The lecture was an overview of the last 20 years of political oppression and autocrat government in Syria. The speaker emphasized how Bashar al-Asad was an exact continuation of the government his father, Hafiz al-Asad held in Syria from 1970 to 2001. Maghout explained that in Syria the government was not only feared but that a cult of reverence toward the al-Asad regime had being built. He explained that in the 40 years of autocratic regime the regime had amassed its power upon a pyramidal network of tribal, religious and economic leaders that belonged to different ethnic groups and tribes. In Maghout’s reasoning, it was these ethnic and tribal differences one of the key elements that allowed for the Syrian government to control the population while confronting them every time political tensions appeared. Indeed, these confrontations were evident after the the 2011 Syrian uprising (from January 26th to March 15th of 2011) and as Salman Shaikh wrote yesterday in the NYTimes (Preventing a Syrian Civil War. NYT. 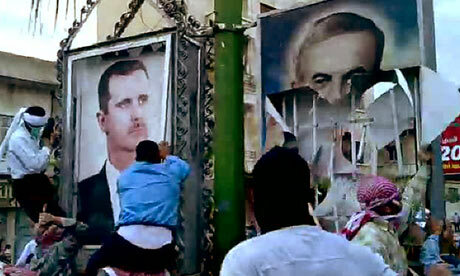 October 12th, 2011), it is these ethnic confrontations and sectarianism that could bring Syria into chaos. One thing was left without a clear answer from Maghout’s lecture. It was the question on “why didn’t Syrians react to all the lies, political oppression and corruption of the al-Asad regime previously”. Maghout explained that Syrians were not only divided in ethnic groups that conflicted within their understanding on “Who Syrians really are”, but that it had passed already too many years of fear for government’s power that brought the population to fear political activity and the use of freedom of speech to protest against government. While this is true, I consider it not to be sufficient reason. It may be necessary to understand which was the role (or lack of it) of the economic leaders during the unrest. I am sure that understanding how crony capitalism works could bring some interesting tools to understand what is the effect of privileges in a society. And as such, could be a valuable tool to understand how can the results of these social movements be differentiated. The participation of crony capitalists protecting corrupt governments and the participation of entrepreneurs is psycho-epistemological different because of the goals they aim to achieve. It is entrepreneurs who most often support (economically and logistically) social movements that demand freedom of speech, equality of rights, an end to corruption and the respect of private property. Thank you Guillermo for your interesting review of my lecture. I agree with you that any analysis of the roots of the current uprising and any attempt to answer the question “why didn’t Syrians react to all the lies, political oppression and corruption of the al-Asad regime previously?” are incomplete without examining the economy of Syria. You referred to “corny capitalism”, which is a term I’m not familiar with, but I think it is closely related to “neo-patrimonialism”. Syria is, I think, a prime example of neo-patrimonialism and the economic elite formed by this system is an integral part of the regime. I chose to focus in my lecture on culture because this is more into my area of research. Unfortunately, studies of the economic foundations of the Syrian regime are as rare as those of its cultural foundations. I really hope to see more of these studies in the future. Mohammad, Thank you very much for visiting my blog. Your lecture was a very informative approximation to many relevant issues in regard to Syrian social movements and I was very happy to learn about it via Isa Blumi. I have found since coming to Leipzig that crony capitalism was a term we mostly use in America and that in the European academia is more used neo-patrimonialism. However, I am still not sure about which term is more accurate and global. Leaving terms apart, I also hope to read more studies of the economic foundations of the Syrian regimes and the whole region. Again, thank you very much for commenting this post.